I finally watched “Let the Right One In” last night, after oh, a good year or so of declaring, “I’m going to rent that!” every time it came up in conversation. And I liked it! Quite a bit, actually. It was very quiet, and methodical, and as a result it didn’t make a direct impact on me while I was watching it. But several hours later it finished seeping in, and I found myself even more enamored of it than when the film concluded. It was a refreshing look at the possibilities of the vampire tale in a market that is insanely glutted with vampire stories at the moment. I’ve heard a lot of wailing about the overexposure of vampires lately, but quite frankly this isn’t new. 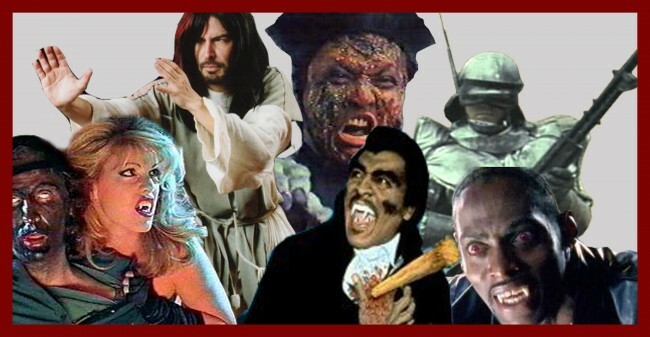 Vampires have been a cheesy part of cinema for decades, and I still love them. Later I may do an article on vampire films of genuine quality. 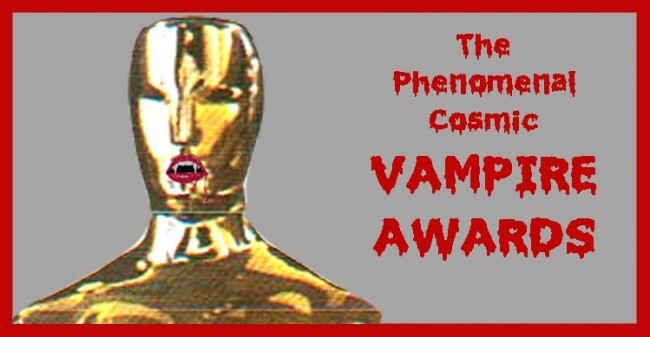 Today, however (and if you follow this column at all you will not be surprised) I am going to give out awards for my favorite, most LUDICROUS vampire movies. God, everything I love is ludicrous. This is one of my favorite movies. Ever. Amongst its many fine features, it includes the most amazing chase scene put to film: a gorilla-faced vampire hopping slowly down a tunnel, followed by the worst tin foil Robocop rip-off of all time marching slowly after it. At one point the vampire falls to the ground and rolls away, presumably because rolling is faster than hopping. The tagline says it all: “In space, there is no daylight!” Okay, maybe that doesn’t say it all, because I am compelled to add that Casper van Dien (oh lord!) plays Captain Van Helsing. And Udo Kier is in the film. And COOLIO! “Three feet tall, two inch fangs!” A small town is overrun by ankle-biting vampire dwarfs on a quest to obtain the blood of the last tall vampire. The town’s only hope? Drexel, the half-vampire, half-human vampire hunter, and his dwarf sidekick T-Bone. That’s all you really need to know. I loved these books. Sergei Lukyanenko, you rock. However the movies make absolutely no sense. In fact, I think reading the books made the movies even more confusing to me, because all of my expectations were confounded. What this movie DID have going for it was the subtitles. The subtitles blew my mind. They fly out of windows. They grow bigger with volume. They are literally spat from people’s mouths. Why oh WHY can’t every foreign film be dynamically subtitled? I know this isn’t directly related to the presence of vampires in the film, but I loved it too much not to mention it. I should mention that the title of this film is case-sensitive. To be accurate, it is “TITanic 2000: A Vampire’s Lust is Unsinkable.” This film rocked my B-Movie world, while simultaneously making me want to crawl under a rock and die. The special effects? Deplorable. I think the ship itself was created in Photoshop. Or maybe MS Paint. And as for the vampire herself… oh jeeze. Her ten-minute stripteases will have you begging to fast-forward. Just take it off if you’re going to take it off! And if you’re not going to take it off, then for the love of all that is holy, just go on to the next scene! A scientist is killing lesbians and grafting their skin onto vampires so that these vampires can walk in sunlight. They are under the mistaken belief that nobody will care what happens to lesbians, but it turns out that lesbians are God’s very favorite people in the world. He sends Jesus to Earth to do battle with the vampires (kung fu battle, no less). Jesus is helped along the way by his friends Mary Magnum and Mexican wrestler El Santo. If that isn’t enough, the glorious theme song is “Everybody Gets Laid Tonight,” by the Hammerheads. Are you watching this yet? SCREAM BLACULA SCREAM: For being a blaxploitation film without compare. BORDELLO OF BLOOD: Because it is a vampire bordello disguised as a funeral parlor, duh! NEXT WEEK ON THE PHENOMENAL COSMIC MOVIE COLUMN: I believe we are due for another B-movie review. I hope you’re ready, because I have something pretty special in mind!